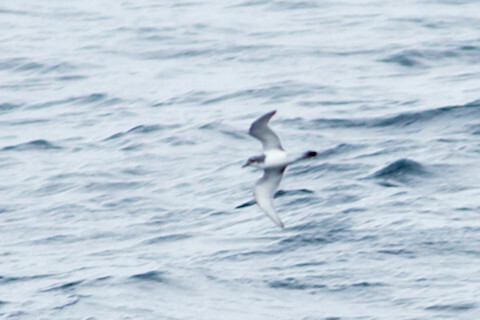 Little Shearwater subspecies assimilis has the dark grey of the head finishing above the eye while elegans has the dark grey coming down just below the eye. The poor light and the angle of view has made the black under the bird's tail seem much more prominent than it should be. *Gill, F & Donsker, D (Eds). (2014). IOC World Bird List (v 4.3). doi : 10.14344/IOC.ML.4.3.